I recently filed an open records request with the Texas Department of Public Safety. I asked for all videos used to train officer for DWI enforcement. I received one DVD. Here is my review of DWI, The Movie. This film starts off by telling officers that “The Research has shown” that there is a good chance a driver is DWI if he exhibits one or more of these signs while driving- Driving Too Slow, Braking Too Soon, Braking Too Fast, Braking Too Late, Weaving In a Lane, Weaving out of a lane, Turning Too fast, Turning Too Wide, Parking Too Far from the Curb, Turning Without a Signal, Making Illegal U Turns, inter alia. 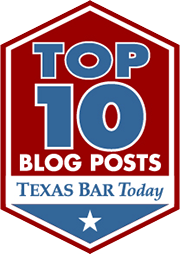 In sum, nearly every moving violation is a sign of DWI. To reinforce this idea the video constantly talks about “The Research” that backs up these findings. “The Research has shown” is a constant phrase throught the film. What the video does not state is the research is flawed, biased, has never been subject to peer review, and has only been evaluated by the Government. It is not “research” it is government propoganda disguised as science. This training video lies to officers. These lies give the moral certainty needed to arrest driver’s who are not intoxicated. “The Research” says it must be done, we can not disagree with “The Research”. Common sense tells us this “research” is false. Look at the traffic violations listed as signs of intoxication. How many of those traffic violations have you committed this year? How many times were you intoxicated? Yesterday I parked too far from the curb. I must have been completely intoxicated!! This video helps explain the illogical testimony I often get from troopers. For example, officers often testify that a defendant’s speeding is a sign of intoxication. However, the same officer will then admit that over 99% of speeders are NOT intoxicated. An officer who will claim that speeding is a sign of intoxication will also never admit the opposite- that the absence of moving violations is a sign of sobriety. Why? “The research” didn’t say that and we do not teach logic 101 at DWI school. DWI is an opinion crime based on junk science. I give DWI, The Movie an F-. It is however, a must see for anyone concerned with the loss of liberty in an age of Neo Prohibiton.